IRVINE RANCH REALTY’s 1% Listing Program can save you thousands of dollars in sales commissions. Timing is key in any market. Your property is submitted and listed on the MLS in as little as 48 hours. IRVINE RANCH REALTY is a fully licensed California real estate brokerage with over 20 years of experience. We will prepare and submit all required state and local real estate forms giving you peace-of-mind. Your property is listed on the MLS and syndicated to over 90 national real estate websites. 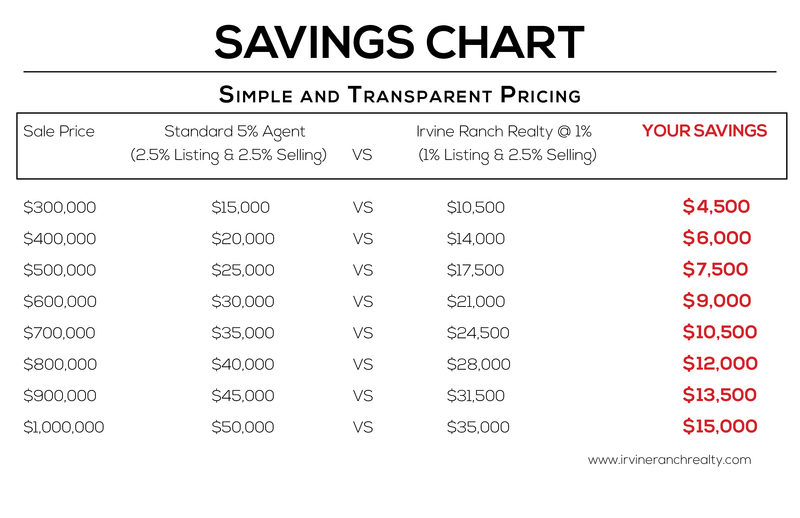 With IRVINE RANCH REALTY you pay only 1% in seller’s agent commissions. Learn how we do it.